Screening test video links, questions, and solutions are given here in pdf for dowloading and here in html for viewing. The preliminary test will be conducted on 3rd September 2017 in Osmania University. There will be two batches (1) 10:00 AM to 1:00 PM (2) 2:30 PM to 5:30 PM. The students are expected to reach the venue and report 15 minutes before the exam. They need to carry their School identification or personel identification. The students are expected to come with a writing pad, pencil, pen, erasure, sharpner and a scale. The students can carry their mobile phone. They are advised to learn how to use stop watch in phone. Students are expected to come after having beakfast or lunch. At the start or end of each batch exam - 15 minutes session will be arranged to provide overview of the examination. The selected students will be personally intimated by their local coordinators. Was conducted on 19th August. Students are requested to bring writing pad. Please reach the venue 15 minutes before start of the test. Contact your local coordinator if you need Venue/Time information. The screening test will be conducted in multiple cities of Telengana. The details of the scrrening test centres and local coordinators contact details are given in poster (pdf). The registration process is very simple. The school principal can send (1) Name (2) Class (3) School (4) Mobile and (5) Email, of maximum of five students via Email/SMS/letter to the local coordinator. The nominations from teacher/parents/students can be considered if there is a vacancy. The screening test will be held on 19th Aug 2017 (Afternoon). Students are requested to bring writing pad. Defence Lab School, DRDO Township, Kanchanbaagh, Hyderabad 5000058. Google Map. Time for Batch I is 1:30 PM and that for Batch II is 3:30 PM. Test Duration is 2 Hrs. State Council of Education Research and Training (SCERT), Telangana forwarded this letter (pdf) to the schools. The students in Hyderabad can nominate themselves. Their registration will be confirmed if there are vacancies as preference is given to nominations received from schools/colleges. Click Self Nomination Form. Student need to bring a pen and writing pad/examination board. Reach the venue 20 min before the scheduled start. NAEST is a two level test (1) School Level, Class 9 to Class 12, and (2) College Level, BSc/MSc. The NAEST involves (1) screening test on 14th Aug, (2) Prelim on Aug 21st (3) Semi Finals on 17th Sep and (4) Final on 18th Oct. Click NAEST General Information to know more. In Telengana State, we are planning to establish screening test centres at multiple centres i.e., (1) Adilabad (2) Hyderabad (3) Karimnagar (4) Khammam (5) Mahboobnagar (6) Medak (7) Nalgonda (8) Nizamabad (9) Rangareddy (10) Warangal. The details will be worked out as time progresses. Shilpa Nandakumar was born on 15 October 1987 to N. Kala and R. Nandakumar. Her academic brilliance was evident from an early age and she was very loving and caring, always willing to share her intellect and economic wealth for the betterment of humanity. Her empathy and kind heartedness endeared her to all who came to know her. As Shilpa passed through adolescence and grew up to be a young woman, she developed (a) very clear thoughts about life issues, (b) a strong sense of propriety, and (c) a vision of what she wanted to achieve professionally and a well laid plan to achieve the same. 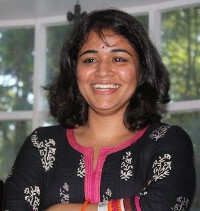 After completing her Engineering Degree from Bangalore, Shilpa went to complete her Masters in Computational Finance from the Tepper School of Business, Carnegie Mellon University at Pittsburgh.She was a go-getter, always willing to stretch the extra mile to take-up challenges and make sacrifices for attaining her goal. Sadly, she was struck by some unknown and mysterious illness, which could neither be diagnosed nor treated leaving the medical fraternity guessing and all her loved ones in despair. Like a meteor, Shilpa came, enthralled and disappeared too soon at the age of 25 on 13th September 2012. Shilpa had wished that science be used to help humanity and to motivate young minds towards that end. To celebrate Shilpa’s life and meet one of her wishes, N. Kala and R. Nandakumar have instituted IAPT- SHILPA NANDAKUMAR MEMORIAL AWARD. We are sure that this will sow the seeds for many flowers to blossom without end and take scientific enquiry to the highest level in this country. (Click docx to download the file related to this award).